Located in the Indian River, central east coast of Florida, Pelican Island was the first national wildlife refuge in the USA, established in 1903 by President Teddy Roosevelt. 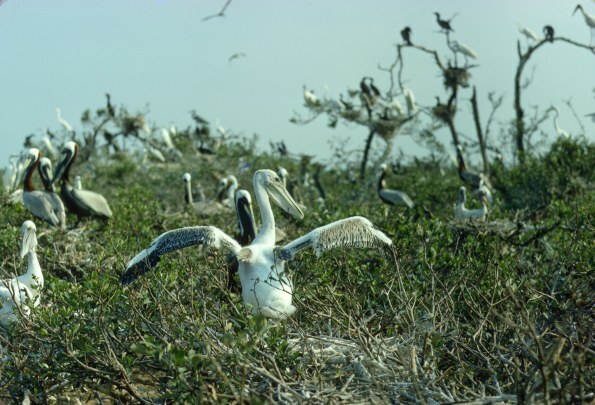 Its purpose was to protect colonially nesting pelicans, egrets, wood storks, and cormorants, all non-game species. Later the US Fish and Wildlife Service, taken over by waterfowl hunting interests, went on to establish a multitude of other wildlife refuges to preserve breeding, migration and wintering waterfowl habitats. It is only lately that the US Fish and Wildlife Service has returned to the original thinking that was behind Pelican Island. It is not true to say that the funding for wildlife refuges comes from the hunting fraternity, from Duck Stamps, because it comes from general appropriations from Congress, from the public domain, or from the Land and Water Conservation Fund. Management of existing wildlife refuges is predominantly still for waterfowl, however. Duck Stamps provide only a small subsidized fraction of the acquisition budgets for refuges, and ongoing management (operations and maintenance) comes from taxes paid to Internal Revenue Service by all taxpayers.